Through the aid of the World Federation of Neurology (WFN) and the American Academy of Neurology (AAN), the continuum courses have been carried out for many years in Vietnam. The courses are conducted one to two times a year, with the topics chosen by members of the executive committee of the Ho Chi Minh City Neurological Association, based on the issues delivered annually by the WFN and AAN. These courses are usually organized in Ho Chi Minh City, the largest city in Southern Vietnam. On May 6, the course took place for the first time outside Ho Chi Minh City in the Mekong Delta. The Tien Giang Neurological Association (TNA) was founded one year ago in My Tho, a beautiful small town in the Mekong Delta and the capital of Tien Giang Province. It now has 60 members. Most of them are neurologists from the surrounding provinces in the Mekong Delta, but some are internists working in rural areas without neurologists. Dr Nguyen Van Thanh, chief of the department of neurology at Tien Giang Hospital and president of the Tien Giang Neurological Association, is actively working and running the association. The discussion lasted past the fixed hours. At the end of the course, Dr. Nguyen Van Thanh, president of the TNA, expressed the gratitude of the Tien Giang Association members to the lecturers, AAN and WFN. The participants showed their gratitude in kind and suggested similar educational courses in the Mekong Delta in the future. The CME course with Continuum — Lifelong Learning in Neurology has contributed to improving the knowledge of epilepsy in our neurologists in Tien Giang and the surrounding provinces. The issues of the Continuum: Lifelong Learning in Neurology, with articles written by experts from the American Academy of Neurology, are useful for our neurologists, especially young members of our associations in Vietnam. We are planning to organize one additional course in August 2015 on “Peripheral Nervous System Disorders.” We believe that afterward we will continue to have the assistance of the World Federation of Neurology. Nguyen Huu Cong is an associate professor; deputy chairman of the neurological department at Pham Ngoc Thach University of Medicine, lecturer of the neurological department of Ho Chi Minh City University of Medicine and Pharmacology; president of the Vietnam Association of Electro Diagnostic and Neuromuscular Medicine; and vice president of the Neurological Association of Ho Chi Minh City. The 55th International Neuropsychiatric Congress (INPC) May 27-30 in Pula, Croatia, was held under the auspices of the president of the Republic of Croatia, her excellency Kolinda Grabar Kitarovic. The organizer of the congress is the Society for Neuropsychiatry, and the co-organizers are the department of medical sciences of the Croatian Academy of Sciences and Arts and the Central and Eastern European Stroke Society. The Congress was endorsed by the World Federation of Neurology (WFN), European Academy of Neurology, WFN Applied Research Group on the Organization and Delivery of Care, European Psychiatric Association and Croatian Stroke Society. The main sponsors of the congress were the Ministry of Science, Education and Sports of the Republic of Croatia, City of Graz, City of Pula and Istria County. There were more than 350 participants from Austria, Albania, Bosnia and Herzegovina, Montenegro, Kosovo, the Czech Republic, Croatia, China, Greece, Iran, Italy, Ireland, Hungary, Macedonia, Germany, Poland, Romania, Russia, South Korea, Slovenia, Serbia, Thailand, Ukraine, United Kingdom and the United States. 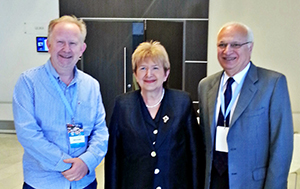 From left: Prof. Hrvoje Hecimovic; Prof. Vida Demarin, INPC president; and Prof. Raad Shakir, WFN president. The congress kicked off with an academic lecture on “WFN: The Way Ahead,” given by our special guest, Prof. Raad Shakir, president of the WFN. The main theme was “Highlights in Neurology — What Have We Learned in the Last 55 Years” in stroke, post-stroke depression, multiple sclerosis, epilepsy, headache and pain and neurorehabilitation, presented by experts in the field, Professors Franz Fazekas, Kurt Niederkorn, Francesco Paladin, Wai Kwong Tang, Vesna Å eric and Vida Demarin. Main topics in psychiatry were “Evolutionary Perspectives in Psychopathology” and “Controversies and News in Psychiatry,” organized by Prof. Karl Bechter and Francesco Benedetti. There were also numerous symposia, in particular: Challenging Child and Adolescent in Modern Society, Fourth European Summer School of Psychopathology, International Sports Psychiatry Meeting, Eighth International Symposium on Epilepsy, Fourth Symposium on the Interface Providers in Neurorehabilitation, Symposium on the Activities of the Association of Public Health Andrija Å tampar, and symposia about stress management and acute stroke treatment. Joint meetings with Alps-Adria Neuroscience Section, WFN Applied Research Group on the Organization and Delivery of Care, and Central and Eastern European Stroke Society, chaired by Professors Leontino Battistin and Vida Demarin on the current status of stroke management in the region and on perspectives and new approaches in neurorehabilitation, also were organized as a part of the INPC. Prof. Anna Czlonkowska from Warsaw gave a special lecture on Wilson’s Disease, with original data from their registry. During the congress, there were 66 lectures within 14 symposia, which were given by 55 lecturers from around the world, and a poster session with many interesting posters. Awards for best posters were given by the City of Graz and by INPC Kuratorium. We are proud of this unique congress, being one with the longest traditions in the world. During the past 55 years, INPC has become a beloved place of meeting, a venue for continuing education in topics of neurology, psychiatry and related disciplines, and a point of scientific and professional exchange of experience for a large number of scientists and professionals from all over the world, continuing on the original idea of sciences and humanity. We hope to keep this success in the upcoming years. Vida Demarin, MD, PhD, FAAN, FAHA, FESO, is president of the INPC. In 1873, Norwegian physician Gerhard Armauer Hansen (1841-1912) [below]discovered rod-shaped bodies — Mycobacterium leprae — in leprous nodules. Initially unable to stain these bodies, he only tentatively suggested that they resembled bacteria, which led to a later priority dispute with Albert Neisser (1855-1916) when Neisser was able to stain the organisms and then claimed priority for the discovery. Although Hansen was convinced that leprosy was an infectious disorder, he was unable to cultivate the organism and unable to transmit the disease to animals, despite 12 failed attempts to transmit the disease to rabbits by inoculation. In 1875, Hansen had been appointed as medical officer of health for leprosy in Norway and as the resident physician at the Bergen Leprosy Hospital. 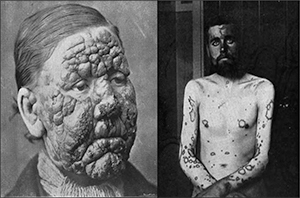 After corresponding with German physician and pioneering microbiologist Robert Koch (1843-1910) in Breslau, Hansen decided to attempt human-to-human inoculations, and specifically to inoculate leprous tissue from a patient with lepromatous (multibacillary) leprosy into patients with tuberculoid (paucibacillary) leprosy [below right] to determine whether he could produce manifestations of lepromatous leprosy. 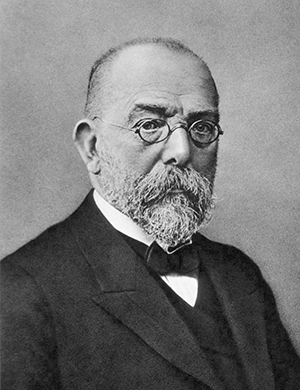 Robert Koch. Public domain. Courtesy of the U.S. National Library of Medicine. While Hansen had already achieved some professional renown for his studies of leprosy, his patients found him aloof and high-handed. On Nov. 3, 1879, while on rounds at the Bergen Leprosy Hospital, Hansen instructed a 33-year-old patient with the “anesthetic type of leprosy,” Kari Nielsdatter Spidsøen, to accompany him to his office as he indicated he wanted to speak to her. There, she saw that he had a sharp-cutting instrument in his hand which he brought up to her eye, while she held him off with her arms. After she was calmed down by one of the other doctors in the room, Hansen succeeded in his goal of inoculating leprous material from another patient under the conjunctiva of her eye with a cataract knife. Despite the criminal complaint against him, Hansen boldly expressed to the court his self-righteous belief that he was justified in these actions: … even if the subject should have some pain, because he had chosen a subject who had suffered from leprosy for many years, and therefore would not be exposed to a new disease. He was quite sure that there was no risk of loss of vision, even if the inoculation should have resulted in a nodule. He himself had several times extirpated nodules from eyes without any trouble, and had succeeded in saving the eyesight. … The great scientific and national importance of finding the answer to the question [of the transmissibility of leprosy] had therefore forced him to act as he did. Although Hansen’s colleagues supported him with various post hoc justifications, it was clear to the court (with Hansen’s own admission) that, in his zealousness to prove the infectious nature of leprosy, he had misused his position of authority by trying to intentionally transmit a disease to a patient placed in his care without the patient’s consent. Douglas J. Lanska, MD, MS, MSPH, FAAN, is with the Veterans Affairs Medical Center, Great Lakes Veterans Affairs Healthcare System, Tomah, Wisconsin. Peter J. Koehler is the editor of this history column. He is neurologist at Atrium Medical Centre, Heerlen, the Netherlands. Visit his website at www.neurohistory.nl. Blom K. Armauer Hansen and human leprosy transmission: Medical ethics and legal rights. Int J Lepr 1973;41:199-207. Lock S. Research ethics – a brief historical review to 1965. J Intern Med 1995;238:513-520. Marmor MF. The ophthalmic trials of G.H.A. Hansen. Survey Ophthalmol 2002;47:275-287. Vogelsang TM. 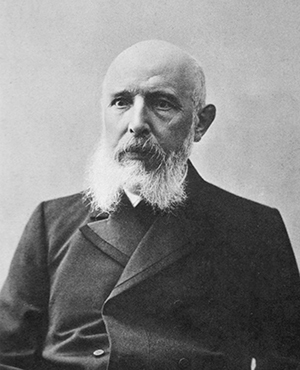 Gerhard Henrik Armauer Hansen: 1841-1912: The discoverer of the leprosy bacillus. His life and his work. Int J Lepr 1978;46:257-332. Walker NP. An Introduction to Dermatology. Third edition. Philadelphia: William Wood and Co.
Prof. Mohamed El Tamawy of the department of neurology at Cairo University. 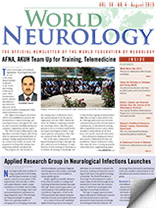 The department of neurology of Cairo University will be a World Federation of Neurology (WFN) Teaching Center for neurology training beginning in 2015. On March 20, the dean and departmental leadership and faculty welcomed an educational visiting committee of Steven Lewis, chair of the Education Committee; Wolfgang Grisold, co-chair and secretary general; and Riadh Goudier, trustee and president of the Panafrican Society. As part of the application to become a WFN Teaching Center, and prior to the site visit, the department had been asked to write structured reports on their clinical teaching program, including detailed written surveys from faculty members and trainees. On the day of the visit, the faculties of the clinical and research departments were introduced, followed by personal interviews by the visiting committee with trainees and teachers. These interviews focused on work conditions and cooperation within the department and the hospital. A formal round through the wards followed these interviews. Patient wards, investigational laboratories and outpatient facilities were explained and inspected by the WFN committee. In a final conference, an exchange of opinions, discussion of structure and academic discussions took place. Subsequently, the trustees of the WFN received a report from the site visit team recommending the establishment of a WFN Teaching Center in Cairo. 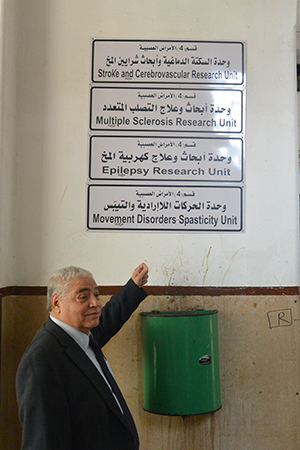 WFN Teaching Centers are being established to improve training of neurologists in Africa, and Cairo will join the first Teaching Center in Rabat, Morocco, which has been running a WFN teaching program since 2014. The WFN is convinced that supporting high-quality Teaching Centers in Africa will improve the quality of training neurologists and lead to additional high-quality institutions of training in neurology in Africa. The WFN is grateful to the leadership and faculty of the department of neurology at Cairo University for its commitment to improving the training of neurologists within Africa, and I look forward to a long and successful collaboration in these efforts. The seventh European Board Examination in Neurology was held June 19 in Berlin, one day prior to the 1st Congress of the European Academy of Neurology (EAN) (http://www.uems-neuroboard.org/). There were observers from the World Federation of Neurology, including from Prof. Wolfgang Grisold. The examination included a written part, with 80 multiple-choice questions (MCQ) and 50 extended matching questions (EMQ). These questions were developed by European specialist sections and were prepared by education standards in an extensive review process. As a new feature, the candidates had to prepare an essay on a neurology-related public health or ethics related topic. This topic was presented by each candidate and orally discussed with the examiners. In addition, a critical appraisal of a neurological topic (CAT) had to be prepared and also was orally discussed with the examiners. Topics of the essays were diverse and covered disease-based topics, such as driving with epilepsy or work- and health system-related topics. The CATs were mainly directed at diseases and therapies, and the presenters were expected to provide a qualified and thorough review on the topic chosen. The examination was well organized and started with the MCQ examination. The rest of the day was spent with parallel sessions of EMQ testing and oral presentations. Two examiners who discussed the presentations and also asked questions in regard to the CAT took the oral presentations. Examiners were paired and selected with regard to language proficiency. The results of the written examinations and the oral judgments were analyzed on the same day, and the results were presented on the same day. Eighty-five candidates showed their interest, 72 sent submissions, 63 showed up, and 55 passed. The following countries participated: Europe and Turkey (34): Austria, Belgium, Italy, Portugal, UK, Germany, Slowenia, Sweden, Greece and Turkey; Non-Europeans (29): Israel, Saudi Arabia, Egypt, Denmark, Pakistan, India, Iraq, Morocco, Tunisia, Cameroon and South Africa. It was the seventh examination of the UEMS/EBN, now with the newly created EAN. This examination introduced the structured essay and CAT, which replaced the prior self-presentation. This new development added a new dimension to the examination, as the candidates were expected to give structured opinions on topics related to diseases and health as well as ethical topics. At present, the European Board Examination is a sign of excellence, and it is hoped that increasingly European countries will accept the European Board Examination as equal to the national examination, or even replace their national examination with the European Board exam. The editorial staffs of the Journal of the Neurological Sciences (JNS) and our publisher, Elsevier, have strived to enhance the quality of the journal. I am pleased to inform you that Elsevier soon will introduce the Journal Workflow Modernization Programme. This new workflow program, which Elsevier has named LeMans, will result in authors receiving proofs of their articles within 24 to 72 hours after acceptance. The LeMans program will significantly decrease the production time for all of our accepted articles. As an editor, I know that authors desire to see their articles published as quickly as possible, and this new feature will accelerate the publication process. Additional steps for enhancing publication such, as the introduction of Article-Based Publishing (ABP) are planned. ABP, which should be introduced in late 2015, will post articles online as soon as they are finalized without waiting for an entire journal issue to be compiled. All of these advancements reflect the ongoing transition from print to electronic publishing. JNS, like many Elsevier journals, is moving quickly toward a totally electronic publishing platform. In our ongoing attempt to enhance accessibility of JNS articles for members of the World Federation of Neurology (WFN), we have selected two more free-access articles, which are profiled in this issue of World Neurology. Stephanie Brown and Andrew Stanfield provide an excellent review of the fragile X tremor ataxia syndrome (FXTAS), which is an increasingly recognized movement disorder. Affected individuals carry the permutation allele of the FMR1 gene. This permutation is an expansion of the nontranslated 5′ CGG repeat region of FMR1 from the normal range, which is less than 45 repeats to between 55 and 200 repeats. Affected individuals are usually men over 50 years of age who have progressive symptoms of tremor, ataxia and cognitive decline. Other manifestations include Parkinsonism, peripheral neuropathy, autonomic dysfunction and endocrine changes. The authors detail the clinical, molecular and neuroimaging manifestations of the disease. They emphasize the neuroimaging characteristics of FXTAS, which include increased T2 signal intensity in the middle cerebellar peduncle (MCP sign), thinning of the corpus callosum and white matter atrophy. Brown SSG, Stanfield AC. Fragile X premutation carriers: A systematic review of neuroimaging findings. J Neurol Sci 2015;352:19-28. Alexander Slade and Sinisa Stanic reviewed the literature regarding the usefulness of salivary gland irradiation for managing sialorrhea in patients with amyotrophic lateral sclerosis (ALS). Many patients with ALS have difficulty controlling salivary secretions. Although oral anticholinergic medications or botulinum toxin injected into the salivary glands can be helpful, patient intolerance or unacceptable adverse effects may occur. This review concludes that the majority of ALS patients with sialorrhea respond well to salivary gland irradiation and experience minimal side effects. Thus, clinicians should consider this treatment option for patients with ALS who are troubled by excessive salivation. Slade A, Stanic S. Managing excessive saliva with salivary gland irradiation in patients with amyotrophic lateral sclerosis. J Neurol Sci 2015;352:34-36. Despite the publication of evidence-based practice parameters for the declaration of brain death by the American Academy of Neurology (AAN) in 1995 and updated in 2010, there remains much variation worldwide in how the actual determination of brain death is performed. Not only does the practice, but also the perceptions of brain death, vary widely across countries. In 2002, an international review identified significant variations in the practice of determining brain death. However, studies such as this have reported primarily on higher-income regions. Earlier this year, several researchers reported in Neurology the results of the largest study to date attempting to assess and characterize both the practices in determination of brain death worldwide as well as the perceptions of brain death among countries. This study aimed to gather data not only from high-income countries, but to gather a comprehensive worldwide dataset. It confirmed that significant variations continue to exist worldwide in both the perception and practice of declaration of brain death. This lack of agreement could become challenging as organ transplantation networks are becoming increasingly internationalized, and supports the need for a stronger international consensus on brain death. The authors conducted an electronic survey, which was distributed to individuals who practiced medicine and had interactions with patients who could become brain dead. The target participants comprised physicians in 123 countries. The survey sought to query individuals with knowledge and expertise in brain death within each country. Included in the survey were members of the Neurocritical Care Society; country representatives of the World Federation of Neurology, who were asked to either complete the survey or forward it to appropriate colleagues, authors of publications on brain death; and international personal contacts of the authors. Responses were tallied from 91 countries, including the African, Eastern Mediterranean, European, Pan-American, Southeast Asian and Western Pacific World Health Organization regions. The findings of the study showed that there remains significant variability in both the perception of brain death as a concept as well as dissimilarity in the practice of the declaration of brain death. Most countries noted a legal provision (70 percent) and an institutional protocol for the declaration of brain death (77 percent), but high-income countries were significantly more likely to have an institutional protocol than low-income countries. In addition, the majority of countries in Africa lacked institutional brain death guidelines. Legal provisions for brain death were more likely in countries with organized transplant networks, even when adjusting for income. This may be related to advances in medical technology, which has led to an increase in organ transplantation in more middle- and low-income countries. This rise in transplantation indicates a corresponding need for understanding of the concept of brain death. medical education in some areas of the world. Interestingly, 57 percent of respondents disagreed with the statement that brain death equates to cardiac death. This response did not appear to be associated with country income level, which may reflect variations among individuals related to personal or cultural beliefs. Nearly all physicians from countries with designated transplant networks agreed that brain death was an established concept at their hospitals. Variations in the practice of declaring brain death were noted as well. While the majority (66 percent) of respondents reported that an attending physician trained in neurology, neurosurgery or intensive care must make the determination of brain death, 25 percent of those polled stated that a resident-level trainee could independently declare brain death. Discrepancies were noted in the clinical examination, with more than half of the countries citing an institutional protocol that was discordant with the 2010 American Academy of Neurology criteria. Apnea testing was another area in which much variability existed, with differences in blood gas requirements, number of tests required and equipment. There did not seem to be an association between the use of ancillary testing and country income level. The authors hypothesized that this finding may be explained by the increased use of ancillary tests by physicians who are unfamiliar with brain death, as the AAN practice parameter does not require ancillary testing in straightforward cases. While this study depended on the responses of individuals, there may be a bias in the nature of self-reported perceptions and practices. The results may not reflect each country as a whole, and there may be regional differences within each country that were not assessed. In addition, the survey was presented in English only, which may have led to some misinterpretation in the questions by responders. In the lowest income countries, the need for a policy surrounding the declaration of brain death may be irrelevant as there are more urgent public health issues. Overall, however, this study represented a large, diverse and worldwide sample. Variations in brain death declaration both in practice and as a concept persists despite advances in communication and education worldwide. This study identifies the challenges in developing a worldwide consensus on the determination of brain death. It is unclear whether creating an international standard for brain death is a feasible goal. In addition to variations in medical education, cultural beliefs and legal codes worldwide, there are also individual differences in practice and beliefs, as evidenced by variations in practice within the United States, which may be related to individual biases and opinions. This study highlights the need for the international community to work together to create a more uniform approach to brain death, especially as the practice of organ donation continues to expand. Torrey Boland, MD, is an assistant professor in the department of neurosciences at Rush University Medical Center, Chicago. Wahlster S, Wijdicks EFM, Patel P, et al. Brain death declaration. Neurology 2015; 84:1870-1879. In accordance with Article 6.3 of the WFN Memorandum & Articles of Association, allowing for additional candidates who are supported by five or more authorized delegates from other member societies, Dr. Daniel Truong (United States) also will contest the post of elected trustee. The fifth Congress of the European Academic Pediatric Societies (EAPS) 2014, was held Oct. 17-21, 2014, in Barcelona, Spain. The Congress was organized by the three societies, the European Academy of Pediatrics, European Society for Pediatric Research and European Society of Pediatric and Neonatal Intensive Care (ESPNIC), including the Nurses Section of ESPNIC. In addition, for EAPS 2014, six other important European pediatric societies accepted the invitation to join as collaborating societies: the European Pediatric Neurology Society, Pediatric Assembly of European Respiratory Society, Association for European Pediatric and Congenital Cardiology, Union of European Neonatal & Perinatal Societies, European Society for Pediatric Gastroenterology, Hepatology and Nutrition, and European Society for Pediatric Infectious Diseases. It was an honor and pleasure to attend the congress and present the poster with the preliminary results of our research, “Sleep Complaints Among the Neurologically Impaired Children: Questionnaire Based Study.” We had the great opportunity to receive remarks and advice from experts and colleagues from Europe about the study design and data interpretation. In addition, I want to point out that I attend the congress with my colleague, Nino Gogatishvili, MD, who also was awarded a World Federation of Neurology travel grant. She also had an excellent poster presentation during the poster session. As I know you received her thanksgiving letter in 2014. Overall, we feel our participation was successful for our delegation. Ambient air pollution is a key disease risk factor producing detrimental health effects on millions of people, particularly children and young adults, across the global community. The neurological effects associated with sustained exposures to concentrations of outdoor air pollutants above the current international air quality standards are an important issue for people living in megacities and small towns around the world and those involved in high-risk occupational settings. Outdoor air pollutants are complex mixtures of particulate matter (PM), gases, and organic and inorganic compounds emitted directly into the air from combustion of fossil fuels, such as gas, oil, coal and fires. New York; Toronto; Salt Lake City; Fairbanks, Alaska; Provo, Utah; the Los Angeles-South Coast Air Basin; Paris; La Oroya, Peru; Santiago, Chile; New Delhi; Beijing; Karachi, Pakistan; Krakow, Poland; Venice, Italy; Frankfurt, Germany; Brussels; and Mexico City residents share their main sources of pollution: transport, industry and heating. Particulate matter fine particles larger than 100 nm and smaller than 2.5 Î¼m (PM2.5) and ultrafine PM <100 nm are target sizes for brain effects, and their main sources are road traffic and industrial emissions. The detrimental impact of air pollution upon the brain in development is critical, as are the long-term potential neurodegenerative consequences upon children and young adults. Air pollution also is a risk factor in multiple sclerosis. We will discuss these topics in our T 20 Thursday, Nov. 5, 2015, Environmental Neurology XII Congress of World Neurology in Santiago, Chile. Oxidative stress and brisk inflammatory responses are important features present in animal models and in humans exposed to polluted environments with diverse particulate matter chemistry as well as high concentrations of criteria pollutants. Neuroinflammation is a key component of air pollution exposures. Megacity children exhibit significant frontal lobe imbalance in genes essential for inflammation, innate and adaptive immune responses, oxidative stress, cell proliferation and apoptosis. The up-regulation of potent inflammatory mediators involves supra and infratentorial regions and cranial nerves, including olfactory bulb, frontal cortex, substantia nigrae and the vagus. Breakdown of the nasal, olfactory, gastrointestinal, alveolar-capillary and the brain-blood barriers has been extensively documented. There is evidence the GI tract barrier also is compromised in the air pollution setting, and recent research links inflammatory bowel diseases, changes in gut microbiome and abdominal pain with air pollution. The GI breakdown likely impacts neuronal enteric populations, and PM could reach the vagus and the brainstem. We suggested that damage to epithelial and endothelial barriers associated with air pollution exposures is a robust trigger of tight junction and neural antibodies. Early dysregulated neuroinflammation, brain microvascular damage, production of potent vasoconstrictors, and perturbations in the integrity of the neurovascular unit are seen in children and young adults exposed to urban air pollution. The accumulation of misfolded hyperphosphorylated tau, alpha-synuclein and beta-amyloid coincides with the anatomical distribution observed in the early stages of both Alzheimer’s and Parkinson’s diseases. Major depressive episodes are linked to neuroinflammation and systemic markers of inflammation. Epidemiological, cognitive, structural, and functional neuroimaging and mechanistic studies into the association between air pollution exposures and the development of neuroinflammation and neurodegeneration in children are of pressing importance for public health. Air pollution has become a key issue in public health and in environmental sciences. What can we do? Knowledge of the issue is imperative. Improvement of air quality is a must, and neuroprevention should be at the core of our efforts as health care providers. Lillian Calderón-Garcidueñas, MA, MD, PhD, is with the University of Montana, Misoula, and Jacques Reis, MD, is with the University Hospitals of Strasbourg, France.